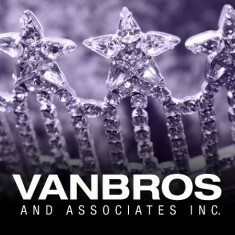 The focus of Vanbros from the beginning, is for this program to provide a fair environment in which young women have the opportunity to better themselves. We hope the pageant encourages the contestants to gain self-awareness, self-confidence, individual pride and greater social awareness. We hope each contestant improves her ability to communicate effectively, speak in front of people, and stand up for her beliefs. We encourage our contestants to find issues she feel's strongly about, and to become involved in organizations and causes that speak to her heart. Each young lady who enters this program has different goals, and we strive hard to assist each young woman in her own personal quest. We're especially proud of the fact that many contestants each year have never been in a pageant and they find it to be a rewarding and worthwhile experience. Many have won on their first attempt, and many others return because it was a positive experience. We like to believe that each young woman who participates in our pageant leaves a little more prepared to deal with the world around them, and more importantly, the world ahead of them! Basically, our philosophy for the MISS KANSAS USA & MISS KANSAS TEEN USA Pageant is not about encouraging young women to ‘win’ a pageant, but to encourage excellence in young women, and to help them develop life skills that will ultimately help them win in life by being the best they can be in everything they do. The second day begins with the personal interview competition. During the interviews, each contestant has the opportunity to meet individually with each judge for a four minute interview. Each contestant has the opportunity to convince the judges she is right for the job of MISS KANSAS USA or MISS KANSAS TEEN USA. Following the interviews, the contestants return to the theater for more rehearsals. The second day ends with the Coronation Show. At the end of the final show, we will have a new MISS KANSAS USA & MISS KANSAS TEEN USA. 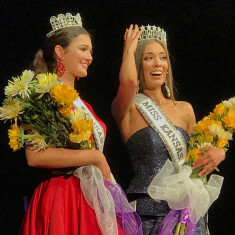 The winner of MISS KANSAS USA will advance to the nationally televised MISS USA Pageant, and the winner of the MISS KANSAS TEEN USA title will advance to the MISS TEEN USA Pageant. Should MISS KANSAS USA go on to win MISS USA, she would then advance to the ultimate contest... the internationally televised MISS UNIVERSE Pageant. Interview: preliminary interviews are personal one-on-one style. You will have four minute interviews with each of the five judges. It's very comfortable and conversational. Contestants are scored on their communication skills, and personality. They are NOT scored on their opinions or personal beliefs. Once the semifinalists are announced during the final show, they will again compete in swimsuit and evening gown. These two phases of competition will narrow the field to a group of five finalists. Miss Kansas USA & Teen USA is the official preliminary to the Miss USA & Miss Teen USA pageants. The winner of Miss Kansas USA & competes at the Miss USA pageant, representing Kansas, for a chance to win the title of Miss USA and further go on to compete at Miss Universe. Miss Kansas USA has four phases of competition that include: private interview, on-stage question, evening gown and swimsuit. 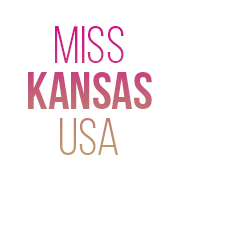 In order to compete for Miss Kansas USA you must be at least 18 years old and under 28 years of age before January 1st in the year they hope to compete in the Miss USA pageant and you need to have won a preliminary title. The winner of Miss Kansas Teen USA competes at the Miss Teen USA pageant, representing Kansas, for a chance to win the title of Miss Teen USA. Miss Kansas Teen USA has four phases of competition that include: private interview, on-stage question, evening gown and athletic wear. In order to compete for Miss Kansas Teen USA you must be at least 14 years old and under 19 years of age before January 1st in the year they hope to compete in the Miss Teen USA pageant and you need to have won a preliminary title.